Reaching the pinnacle of one’s profession is a goal which every business aspires to achieve. Designing Dreams is also a pursuit which every wedding business strives to deliver to their brides. 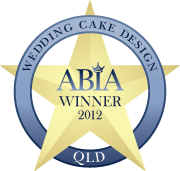 On Tuesday the 10th of July 2012 one of Queensland’s foremost wedding suppliers, Merivale Cakes and Crafts was recognised for their consistent achievement of Designing the Dream of a brides perfect day by being announced as the Winner of the 2012 prestigious ABIA award. The Australian bridal market is one of the most demanding of industries as it requires wedding suppliers a once off opportunity to deliver excellence the first time, every time; there are no second chances. Repeating this outcome bride after bride is a daunting task for which thousands of wedding suppliers strive to achieve. It is all the more daunting when the entity who determines this outcome are newlyweds who have been through the process of selecting and engaging wedding suppliers who have demonstrated their ability to design the ingredients which culminate in the delivery of the perfect day. Merivale Cakes and Crafts is one such company who has consistently delivered these dreams to their brides. The Chairman of ABIA Mr John O’ Meara said that Merivale Cakes and Crafts should be extremely proud of being honoured by Australia’s peak industry body as one of Queensland’s Top wedding suppliers, especially when one considers the level of passion and commitment required to consistently excel in the design of products and services which culminate in the delivery of the brides perfect day.